Hypotonia is a disorder in the nervous system that causes low muscle tone. Low muscle tone can be defined as the passive resistance to a change in length, in other words it refers to the stiffness of the muscle. A muscle with low tone is less stiff than usual and is more easily stretched and bended. Low muscle tone is used to describe muscles that have less tension and feel floppy. As a result a child with low muscle tone may need to exert more effort whilst completing an activity in order to activate their muscles. This can lead to difficulty maintaining a good posture when sitting or standing and they may tire more easily due to the extra effort they are required to use. Hypotonia can affect children to different extents. 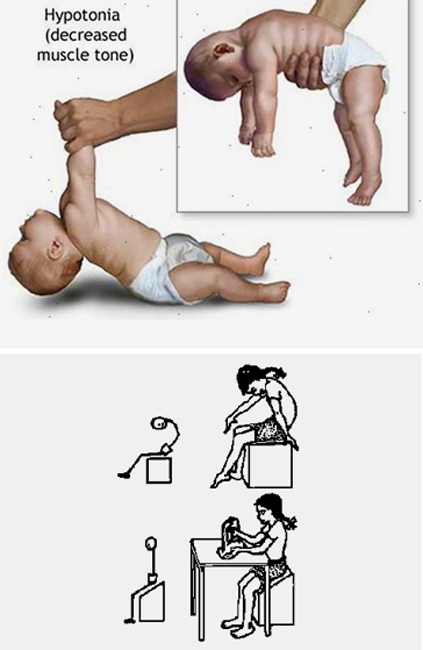 For example some babies show obvious symptoms of low muscle tone from birth, while for others the hypotonia is not as obvious and often difficult for the parents to detect. They may show signs of good muscles, by showing they are strong, and running around, but then you may notice that they tire easily and have trouble sitting for periods of time. Another example is with running, children with Hypotonia often run with a wider gate and forward lean. The low muscle tone means that they learn to adjust. The wider gate helps the child to be more stable at faster and slower speeds. Hypotonia is not a specific medical disorder but can result from many disorders that affect the muscles, connective tissues, nerves, the spinal cord and the brain. Low muscle tone is almost always found in children with benign congenital hypotonia, joint hypermobility and Down syndrome. It can also be associated with children who have autism, delayed motor development, developmental coordination disorders, and dyspraxia. Recognising hypotonia, even in early infancy, is quite straightforward; however diagnosing the actual cause of the disorder is very difficult and often unsuccessful. There is no cure for Hypotonia, however options are available to help improve your child’s well being and help them to live with this disorder. Sometimes ankle/foot orthoses are used for weak ankle muscles. However each child varies so we highly recommended seeking appropriate medical advice. child and provide appropriate treatment options and advice.